Happy Holidays: Christmas decorations for 2015 - part 2. Hi there, welcome to part 2 of the Christmas decorations for 2015. The antique buffet that belonged to my Dad's parents is turned into a forest. The two 4 foot trees that I made go on the top shelf of the buffet along with a 3 foot vintage feather tree. The main area of the buffet has a forest of bristle brush trees with a few cardboard houses in front of them. We used to do a large village on the buffet but we needed an area to place goodies to eat so in front of the small housing development we have vintage glass ware with coloured mini lights around them. The glass sparkles and looks wonderful whether the dishes are filled with cookies or not. 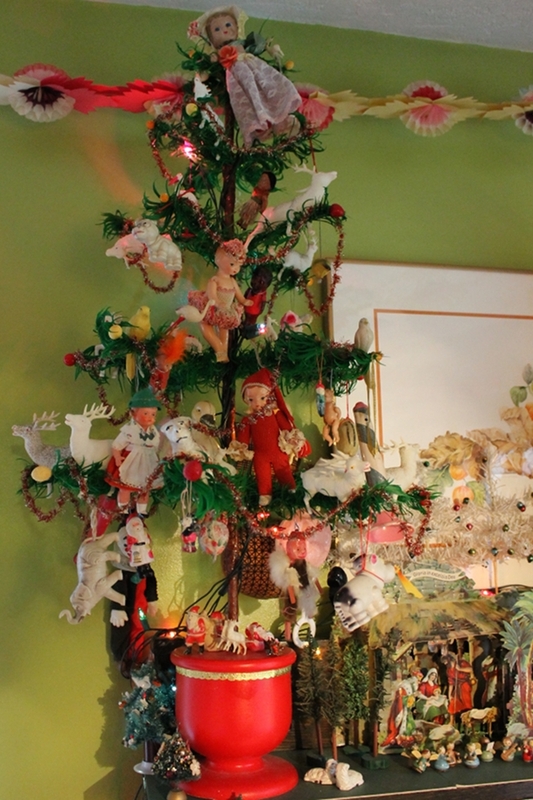 The feather tree on the left is decorated with all things celluloid; decorations, toys, tape measures, and baby rattles. It is then trimmed with a gold tinsel and red cellophane garland. Beside the celluloid tree is an old chromolithograph nativity scene that belonged to my Mum. Trees are tucked in any empty space to give the effect of a forest. 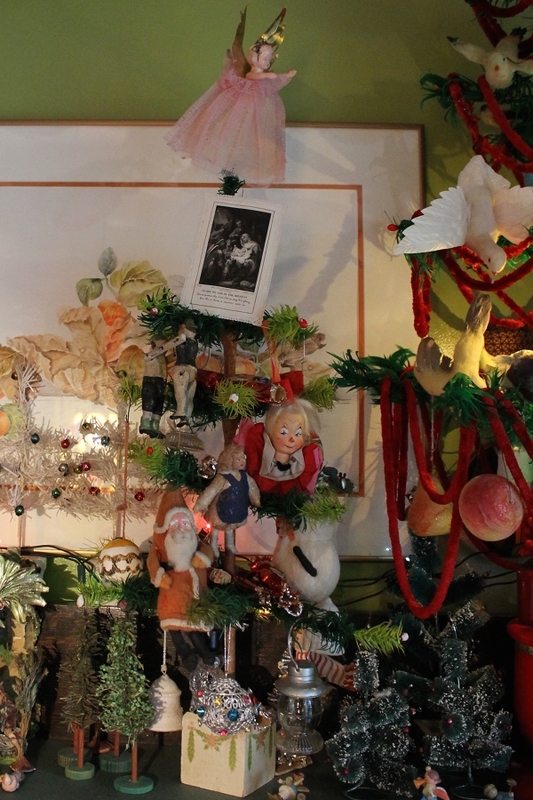 The vintage feather tree has assorted antique and vintage decorations on it. The egg that is just behind the cotton batting Santa is from a girl in my grade 5 class in 1958. When we were taking down our class Christmas tree I traded some foil covered paper icicles for two decorated blown eggs. The clown head is Italian, I am not certain if it is a Christmas decoration but there is a cloth loop for hanging so it works for me. 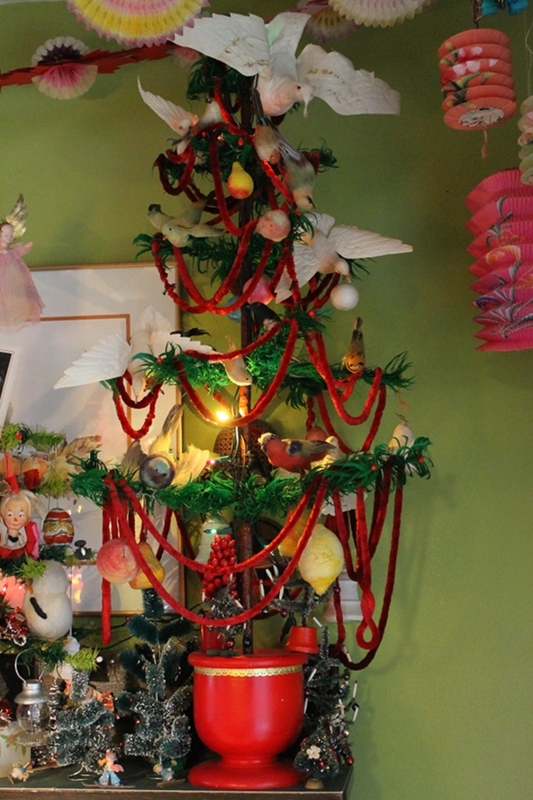 The last feather tree is decorated with cotton batting birds, cotton batting fruit, cotton batting bells and is trimmed with a thick red 1940s chenille rope. The other blown egg decoration is hanging beside the Italian clown. The third and final part of our Christmas decorations will be coming shortly. absolutely charming! I also collect vintage bottle brush trees and Putz houses - they are magical! Thanks for sharing.